The farm-down of the 1.2GW Hornsea One site off the coast of the UK for DKK 15.1 billion represented more than half of its earnings before interest, taxation, depreciation and amortisation (Ebitda) last year, the developer stated. Earnings from operational wind farms increased 29% year on year, pushing up operating profit, while onshore earnings "contributed marginally", the Danish company added. Ørsted commissioned the world’s largest offshore wind farm, the 659MW Walney Extension in 2018, as well as the 573MW Race Bank and 450MW Borkum Riffgrund 2 sites. The record-high operating profit also meant Ebit increased 52% to DKK 24.6 billion, which in turn led to net profit from continuing operations reaching an all-time high of DKK 19.5 billion, Ørsted stated. The net profit result was due to the higher Ebit, but was partly offset by higher finance costs and higher taxes, the developer added. Ørsted increased the share of renewable energy in its generation mix from 64% to 75% last year with the addition of new offshore wind farms in the UK and Germany and acquisition of US wind and solar PV developer Lincoln Clean Energy, which has an operating portfolio of 813MW. By the end of 2018, its portfolio consisted of 12GW of onshore and offshore wind projects and biomass-fired combined heat and power plants either in operation, under construction, or that have reached financial close, Ørsted stated. The company added that it was "well on track" to reach its target of 99% green generation by 2025. It stated that it expects to make gross investments of between DKK 21 billion and DKK 23 billion in 2019, "reflecting a high level of activity related to offshore and onshore wind farm projects". Between 2019 and 2025, Ørsted plans to invest a total of DKK 200 billion, of which it would allocate 75-85% to offshore wind, 15-20% to onshore wind, and 0-5% to bioenergy and customer solutions, it added. It stepped up its efforts to break into the US offshore wind sector with the acquisition of developer Deepwater Wind in November, following unsuccessful tender bids in Massachusetts and Connecticut. 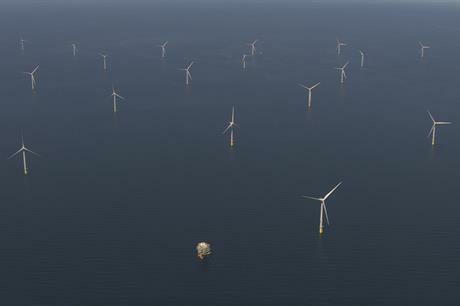 Ørsted also has its sights set on Japan, and concluded a memorandum of understanding with utility Tokyo Electric Power Company (Tepco) to work together on offshore wind projects. It has now resumed development in Taiwan following a standoff over the government's plans to lower the feed-in tariff for offshore wind farms.